OR: I couldn't call this blog Trail of Papers, and not publish, now could I? My work of the last two years has just been published in PNAS. I know you, dear reader, are busy, so here are four key panels from the paper. PSTH from a mitral cell responding to ethyl butyrate. The cell was excited during the odor, but inhibited afterwards. In the example above, the cell switched its firing from excitation to inhibition between the odor to the post-odor. Other cells could switch the other way, from inhibition to excitation; or could have more subtle shifts in phase between the odor and post-odor (Fig. 3 of the paper). Around 30% of cells had some sort of post-odor response, and these post-odor responses could last for over ten breaths after the odor was gone. To see whether these post-odor responses were odor specific, we performed some population analyses, and found that the post-odor responses were unique for each odor. However, as you can see above, these post-odor responses were not simply recapitulation of the odor responses. Given that these post-odor responses are different from the odor response, but contain odor information, we dubbed these responses odor afterimages. Response of three glomeruli to acetophenone. Some glomeruli did have a post-odor response, but most did not. Given that some glomeruli did have post-odor responses, we tried to compare the post-odor activity in glomeruli and mitral cells using a template matching prediction algorithm. The glomeruli prediction was only above chance for one breath after the odor, showing that the post-odor responses did not contain much post-odor information. 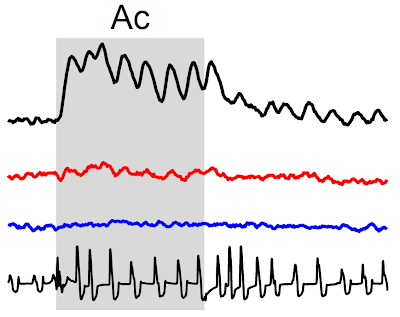 In contrast, the mitral cell responses lasted for over ten breaths. So while some of the olfactory bulb inputs may be long-lasting, there seems to be more information in the mitral cell responses than can be explained by simple peripheral processes. 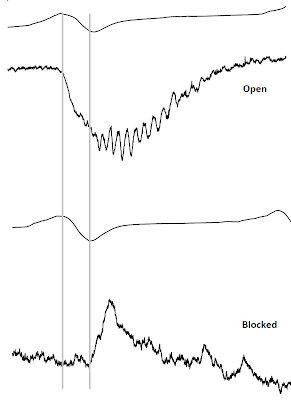 LFP activity in the mitral cell layer of the OB in response to an odor with the nostril open (top) or blocked (bottom). With the nostril open, the odor elicits a large LFP deflection early, and gamma frequency oscillations after 50-100 milliseconds. With the nostril blocked, there is an LFP deflection, but it is delayed, and contains less gamme frequency. Breathing activity shown above LFP (inspiration is up). Total time ~1 sec. There are a couple interesting things about the blocked nostril LFP. First, the sign of the activity is flipped, which may signal a switch from excitation to inhibition, or some other process. Second, the activity with the nostril blocked is delayed. This could reflect the time it takes for information to get processed in the contralateral olfactory bulb, and then relayed to the ipsilateral olfactory bulb. 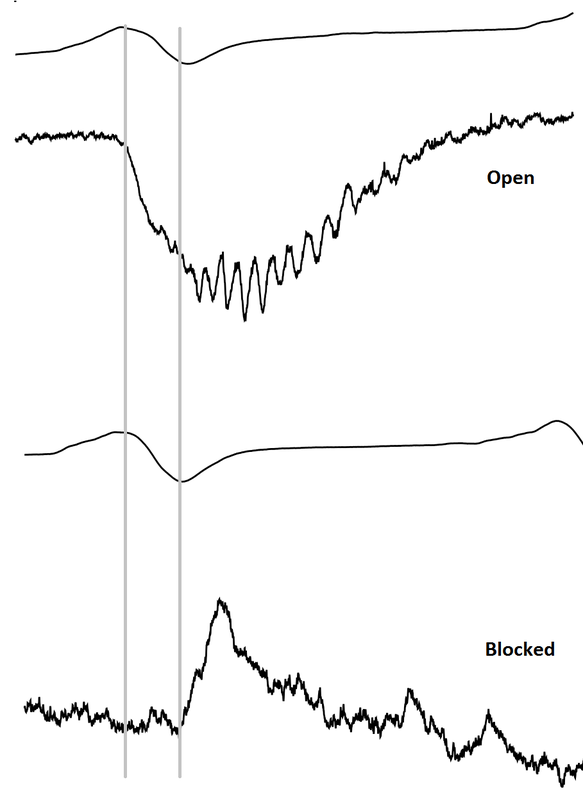 The gamma frequency activity in the open nostril condition also seems to coincide with the onset of activity in the blocked condition. This is not a particularly conclusive or informative result, but I love the idea of olfactory responses absent odor input, and the strange nature of these responses. 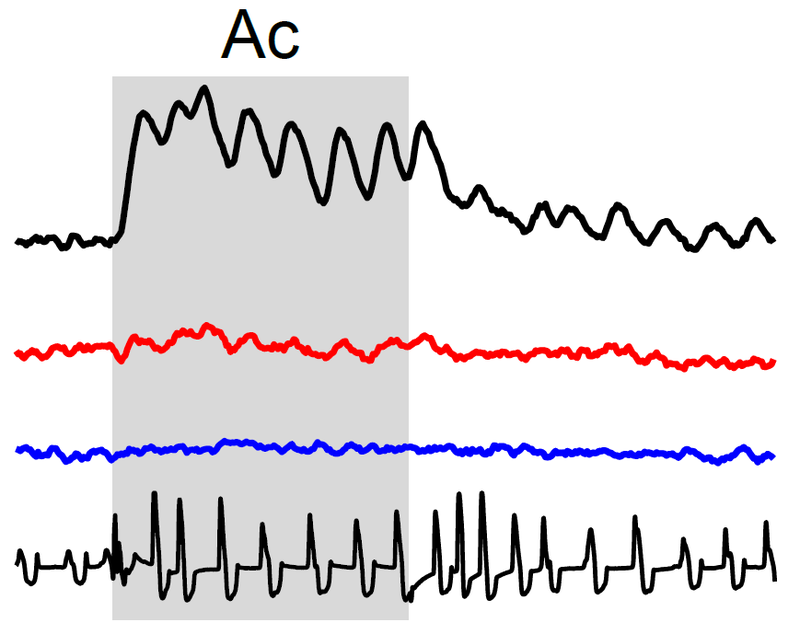 PSTH of firing in a mitral cell in a Thy1-ChR2 mouse during and after photostimulation at 20Hz. 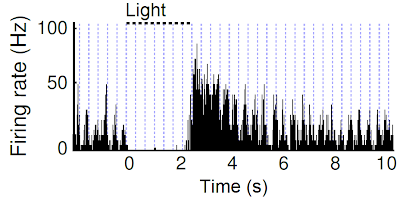 It was difficult to record spikes during photostimulation, perhaps due to inhibition. Afterwords, the cell had rebound activity for a few seconds. Some cells were inhibited after light stimulation, others were excited, and others were completely uneffected. I'm not current on ringing activity in other brain areas, but I think it's interesting that if you put the olfactory system into an active state, it takes a few seconds for the brain to calm down. We did most of these Thy1-ChR2 experiments in anesthetized mice, because in the one awake mouse I stimulated, the mouse started freaking out and drooling. I don't want to know what it smells like when your entire olfactory bulb is activated. So those are my favourite four figures of the paper. There are a lot more interesting tidbits scattered throughout, and I hope the paper is readable to a general audience. Hopefully my blogging over the last few years has improved my writing style. I suggest you check it out. congrats on the paper! very nice results! "We did most of these Thy1-ChR2 experiments in anesthetized mice, because in the one awake mouse I stimulated, the mouse started freaking out and drooling. I don't want to know what it smells like when your entire olfactory bulb is activated." How do you know that you are not just inducing a seizure? Drooling is a common response in rodents when seizing. That is a great question. I'm not an expert on epilepsy or seizures, but are there other external signs of seizure? If I remember correctly the mouse was not stiff, but was scrambling with its front legs. Second question, has anyone induced epilepsy or seizures via ChR2? I did a brief Google Scholar search (from home) and didn't see anything. It would actually be kinda interesting if the olfactory bulb was a particularly sensitive brain area for kindling. That literature is actually quite old and substantial. "In the initial kindling study of Goddard et al. area of the limbic system (cf Racine et al., 1989). appears to be the most sensitive area in the brain for a development of a chronic elileptogenic condition (Racine et al. 1989). Also see this recent PLOSOne paper using a transgenic line where OSNs only express the octanal receptor (it responds to more, but Araneda et al. 2000 showed that octanal was best ligand for activation). If you present octanal to the monoclonal nose the animals start seizing.